A few places in Cherry Hill tell the story of how the Revolutionary War impacted the area more than 200 years ago. 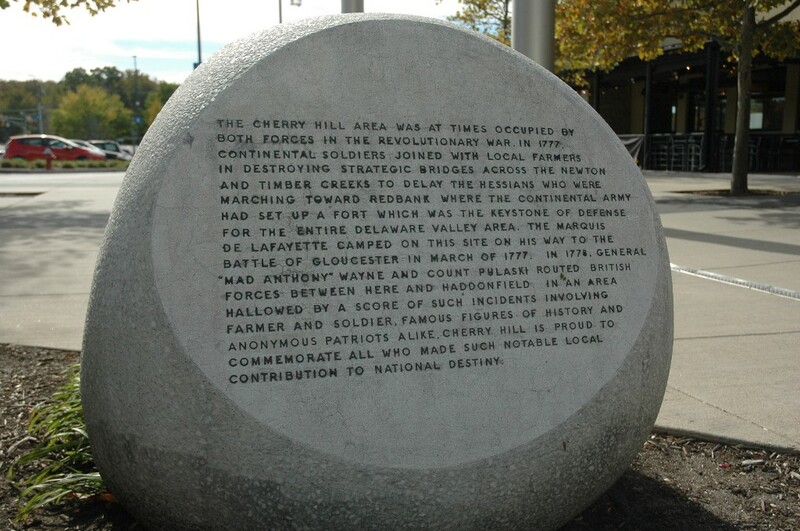 The Cherry Hill Monument outside the Cherry Hill Mall honors those who fought for America’s independence in the Revolutionary War. More than 200 years ago, the Philadelphia region was a key location during the American Revolutionary War. From September 1777 through June of 1778, British forced occupied Philadelphia. In addition, a number of battles took place in the region. In Mike Mathis and Lisa Mangiafico’s book, “Cherry Hill: A Brief History,” the authors write no known major battle took place in what is today Cherry Hill Township. However, there are a few places in the township where the history of the Revolutionary War in the region is memorialized. Some Revolutionary War history is inscribed on a small boulder-like object sitting on the sidewalk near the entrance to Macy’s at the Cherry Hill Mall. The monument memorializes two historical events. On one side of the boulder, the words Cherry Hill and the mall’s opening date of Oct. 11, 1961 are inscribed. On another side of the monument is a list of the mall’s original owner, architects and builder. The third side of the monument talks about the Revolutionary War. The monument gives a short description of events that took place in the region during the war and honors those who fought for America’s independence. The monument also acknowledges how both American and British forces occupied the area at different times during the Revolutionary War. A couple other locations in Cherry Hill serve as a reminder of when British forces cross through the area in 1778. On June 18 of that year. General Henry Clinton and his British army left Philadelphia. Their path out of the city took them through South Jersey, including parts of modern-day Cherry Hill. This historical sign along Brace Road marks the location of Old Salem Road. Along the side of Brace Road, a sign marks the location of Old Salem Road. 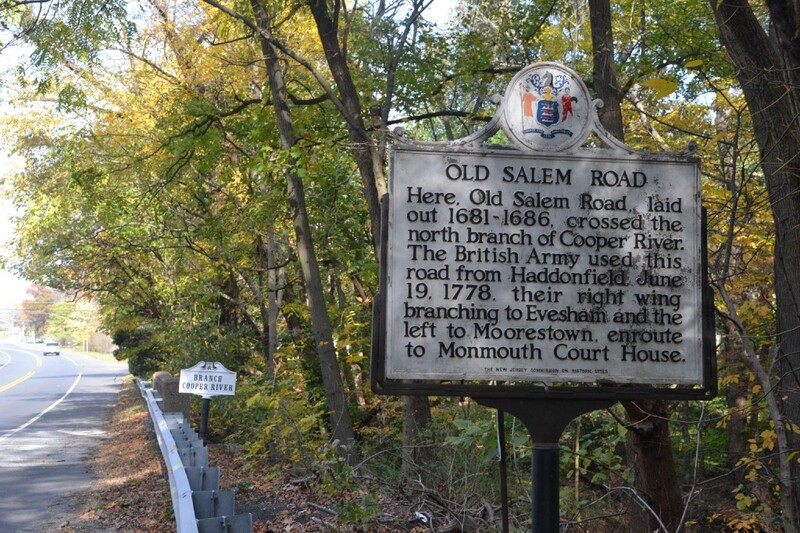 Old Salem Road was a long route stretching from Salem up through modern day Gloucester and Camden counties to Burlington. Part of the road ran through present-day Cherry Hill, crossing the north branch of the Cooper River. On June 19, 1778, the British Army marched through the area, following Old Salem Road to the north from Haddonfield. Bonnie’s Bridge is the last surviving stone arch bridge in Camden County. A short distance from this sign is a landmark that has stood the test of time. In “Cherry Hill: A Brief History,” the authors say more than 15,000 soldiers crossed a stone arch bridge located in what is now the Barclay Farm section of Cherry Hill. The soldiers broke into two flanks. One flank went to Evesboro, while the other continued north and east to Moorestown and eventually, to Monmouth, where they would later fight against the Continental Army in the Battle of Monmouth. The bridge the British soldiers crossed is still standing today. Located on the property of a Wayland Avenue home, the bridge is the last surviving stone arch bridge in Camden County. 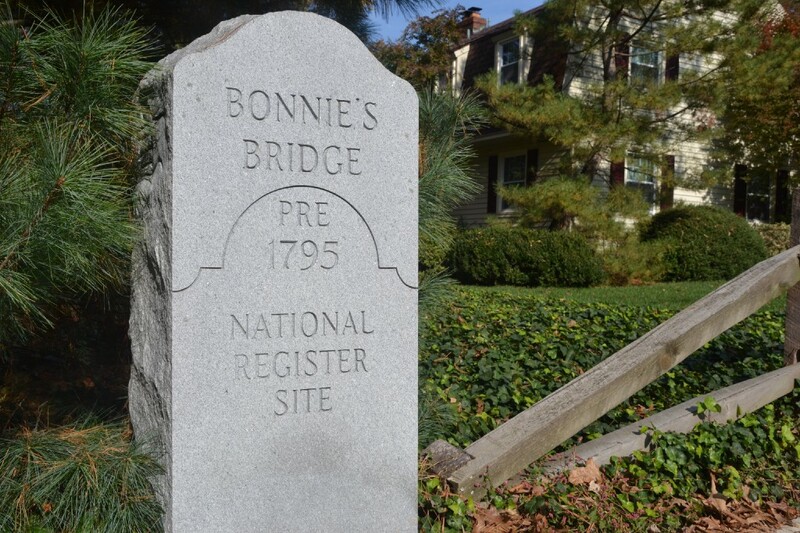 The bridge is named Bonnie’s Bridge after Bonnie Cocchiaraley, a long-time Cherry Hill resident who discovered the bridge when she lived at the property more than 40 years ago. Cocchiaraley led the effort to get the bridge added to the National Register of Historic Places in 1981.